We are available 24/7 to give you a free price estimate for our cleaning service. Just contact 020 3746 1366 or use the online contact form right away! We are a professional cleaning services provider which is highly interested in achieving full customer happiness. We spend most of our time and financial resources in making sure that our carpet cleaners in Streatham SW16 are properly qualified and well equipped with state-of-the-art cleaning tools and machines in addition to Prochem eco-friendly and safe cleaning solutions. Our carpet cleaning service is executed in compliance with our safety and quality procedures. We can have all carpet types perfectly cleaned, even the most delicate ones, such as expensive Persian rugs, silk rugs or antique rugs. We offer fibre protection on demand through the use of a powerful stain protection layer after the cleaning. To receive the top customer care service and the finest carpet cleaning around, book our professional rug and carpet cleaning service now! We clean all kinds of carpets and rugs and our services are suitable for residential and commercial properties as well. Ever since 2005, Ashlee House Cleaning has been performing professional deep carpet cleaning, including: dry foam carpet cleaning, steam carpet cleaning and carpet stain and spot removal in the entire Streatham SW16. We hire all of our cleaners based on recommendations from trusted source. They are all carefully vetted, trained and constantly monitored for compliance to all of our safety and quality procedures, as well as for following our detailed professional cleaning checklists. We are constantly investing in purchasing the latest, most safe and efficient professional cleaning equipment, instruments and Prochem certified eco-friendly detergents. The carpet cleaning teams can also provide: blinds cleaning, drapery cleaning, curtain cleaning, mattress cleaning and bed bug mattress treatment. We give all of our customers who book more than 1 service at a time discounts up to 50 percent of the cleaning price. Our skilled cleaning technician in Streatham SW16 will examine your carpet or rug carefully to determine its material and condition. A professional vacuum cleaner is used to remove as much dust and dirt out as possible. Then any removable stains are pre-treated with special stain removal products. All solutions are tested in advance for safety’s sake. Based on the type of carpet you have either steam carpet cleaning or dry carpet cleaning is performed. The steam carpet cleaners wash and rinse off the carpeting with a hot water extraction machine. 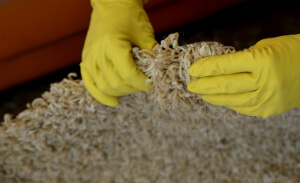 The dry carpet cleaners treat the carpet with dry compound cleaning foam, and then hoover it off. Both are highly efficient carpet cleaning methods made for deep cleaning of synthetic or natural materials. Steam cleaning requires some drying time, while with dry cleaning, the carpet is ready to be stepped on immediately after the cleaning is over. Take advantage of our easy booking system now! No deposit is needed for booking our carpet cleaning experts in Streatham SW16. Speak to our 24/7 customer service at 020 3746 1366 or online here. Choose any day you want for the cleaning service. Our quite affordable prices are fixed, so we have no hidden charges. You can get preferential rates if you are an estate agency, regular client, a landlord or if you book early. You will get a discount for ordering a combination of our cleaning services today!